The Lynbrook Stakes is a difficult puzzle since the majority of the runners with dirt experience are coming out of very slow races. Three fillies exit the opener on June 14. It’s a problematic race for speed figure-makers to assess since the final time came up very slow in comparison to all of the other races on the card. Native Dawn (#5) ran well to win that race, but the horse who figures to attract the most attention out of that spot is She’s Trouble (#7). She dwelt very badly at the start, which is a major concern, as she obviously has gate issues. However, she also appears to have some ability, as she somehow was able to rally for third despite giving away about 10 lengths at the start. Linda Rice has fantastic numbers with second-time-starting maidens on dirt. I’m using her, but there are others to consider. Positively Jean (#9) was arguably the most impressive debut winner in this field, but that win came on turf. While she does have more of a dirt pedigree, she’s still a wild card in this race. Midnightsalright (#1) never got involved while racing wide in her debut at Monmouth, but that race came against a solid open-company field, and Jason Servis’s runners have been winning at an astronomical rate. I’ll use all of these horses, but I want to bet the live first-time starter, TOSSUP (#8). It’s always a good sign when capable connections display the confidence to start a horse’s career in stakes company, and this filly does appear to be working well. She easily outworked a stablemate on June 20 and appears to have an effortless way of moving through her drills, suggesting that she has some quality to her. 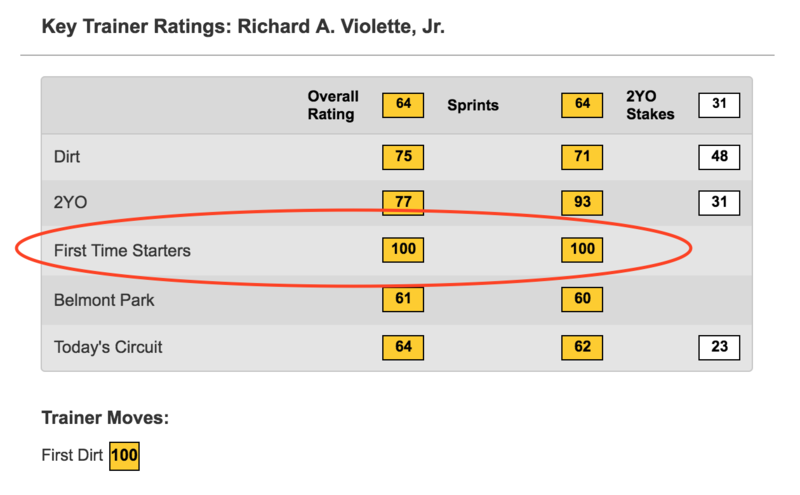 Rick Violette is one of the best in the business with first-time starters, as his 100 TimeformUS Trainer Rating with horses making their debuts indicates. Drilling down into that statistic in DRF Formulator, over the past five years he is 16 for 51 (31 percent, $3.80 ROI) with 2-year-old firsters in dirt sprints. Furthermore, Tossup is bred to be a runner, as she’s out of a Grade 1-placed dam who earned more than $460,000.